Use Sigma to explore your data, then embed your dashboards in the contexts where the information is most relevant. All Sigma Admins have the ability to generate public sharing and embedding links. 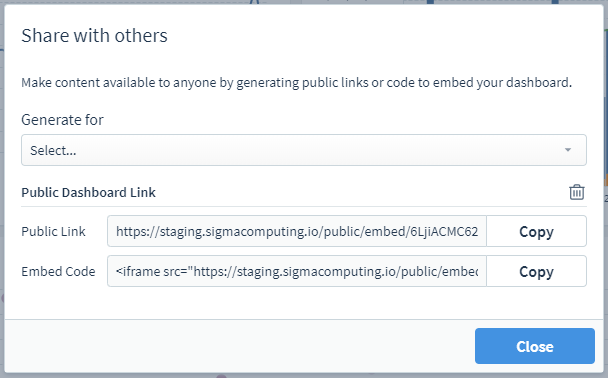 You must be a Sigma Admin to generate a public dashboard link for embedding and sharing. Create the dashboard that you would like to embed. Go to the upper right-hand corner of your screen and click the arrow next to the ‘Edit’ button to open the drop-down menu. Click the drop-down menu and choose to generate the public share link(s) for individual charts or the full dashboard. Click the trash can next to the embed link you would like to delete. Once you delete a link, that share link is no longer valid. If you choose to generate another public sharing link, it will be a new unique link. Add ?embed=true to the end of your published dashboard URL. You can use this appended URL in an iframe to create a secure, embedded dashboard.